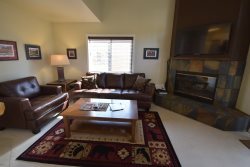 This 3 bedroom vacation home has been updated and newly furnished to provide you with very comfortable accommodations for 6 people. There is a ground floor bedroom with an adjoining bathroom, a sunroom, a reading nook as well as a combined living and dining area. Features include a large flat screen TV in the living room, outside there is a deck for grilling on the BBQ and lazing around on a Summer's day! Upstairs there are two bedrooms with a shared bathroom. *Pool & Hot tub are open during Summer. Hot tub is also open during Winter/Ski Season.